This is my brand new all-time favorite meal of all time today right now. It may look all fancy face, but in reality, it’s just a plain ol’, delicious cinch to pull together. Three things happen. Let’s discuss. You’re excited, I can tell. If you can’t find small grape tomatoes on the vine, you’re still a good person. Just roast a cup or two with a few sprigs of fresh thyme leaves and a small glug of oil. And say glug a lot, because you’re overdue for a good face punching. 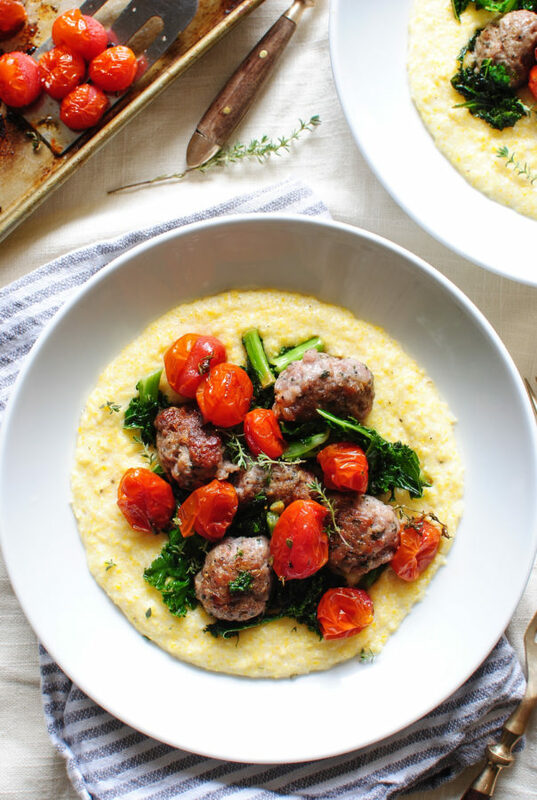 You take some Italian sausage links and roll them into meatballs. You could also just brown the sausage like a normal person, but I thought making them into meatballs seemed a bit more festive! It’s festive, right? It’s totally festive. 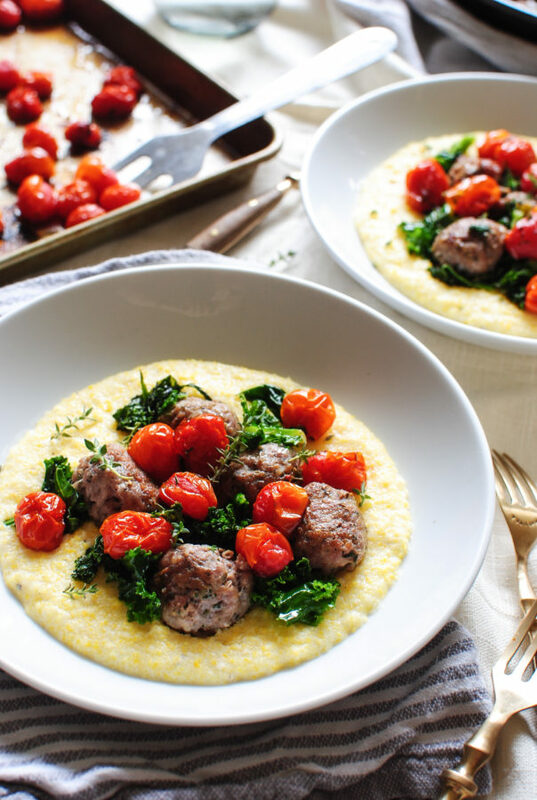 In the meantime, make some creamy polenta. Contrary to popular belief, making polenta isn’t at all laborious! Even the slow-cook kind. I just keep the pot on medium low-ish and stir every couple of minutes, until the polenta doesn’t drip off the back of a wooden spoon. Takes maybe 15 minutes. 10 even. Not long. Then you stir in butter and parmesan, and the soul fairies in your heart unleash and do the Macarena. 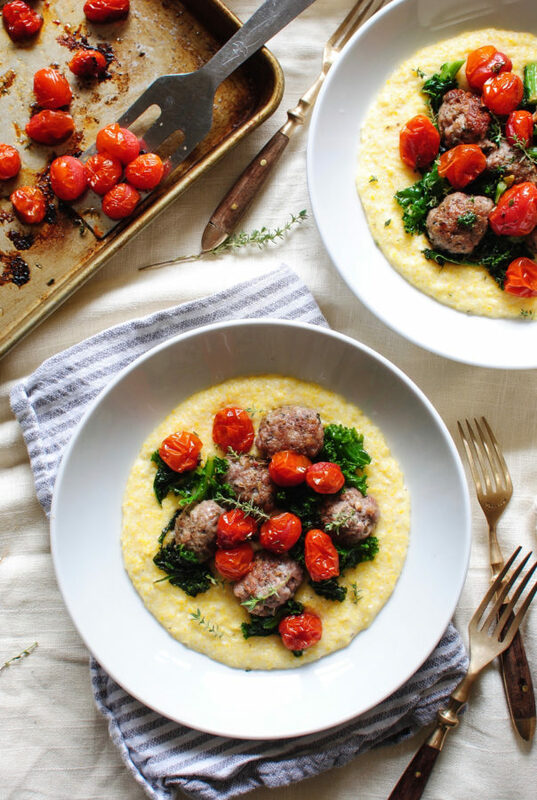 Now just ladle a good ol’ plop of polenta down in a bowl, and take the back of the ladle and sort of spread it out all nice like, as you pretend you’re a chef named FWALAWALOUSEZ. 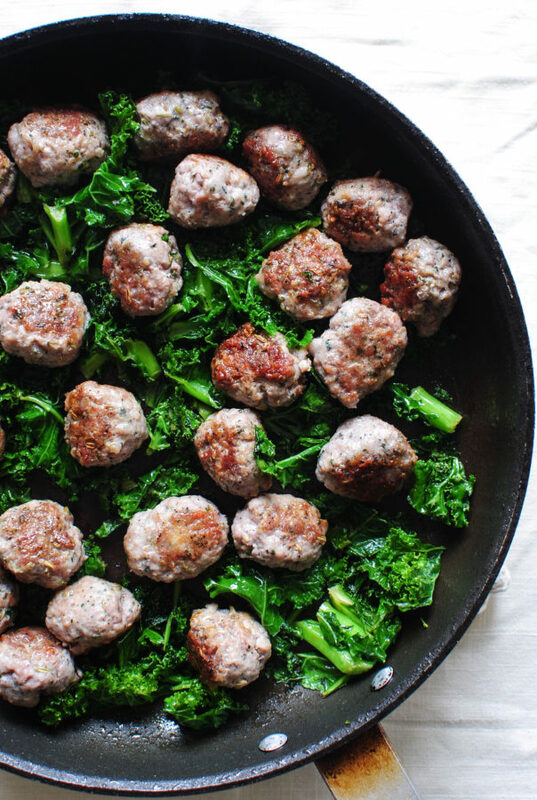 Then just arrange a few meatballs on it, some kale, a few roasted turmaters, and that’s life, you guys. Life. Extra thyme leaves for garnish? Yeshhh. More grated parmesan (also known as “cheese rain” for the kiddies) on the ready? Obviously. Absolute ridiculous creamy, savory, deliciousness to the max? Duh. 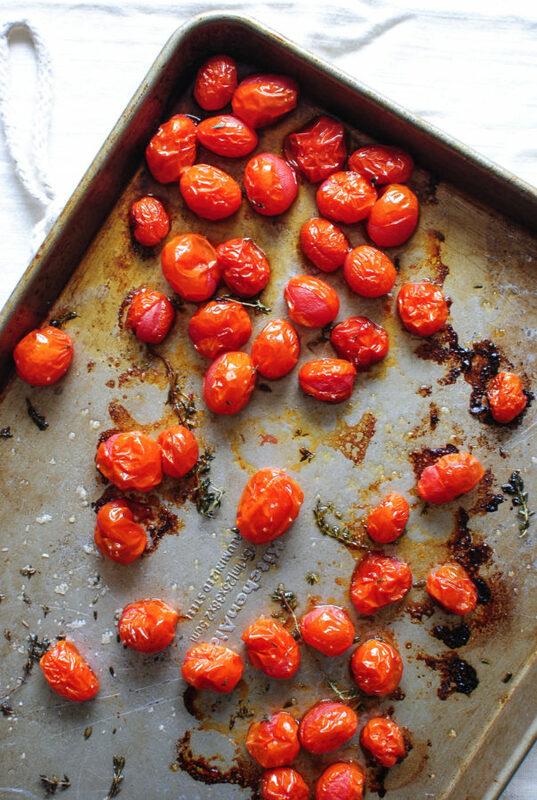 On a baking sheet, arrange the tomatoes and drizzle with the oil. Sprinkle with thyme leaves and season with a pinch of salt. Roast for 20 minutes, until the tomatoes are blistered and wilting. 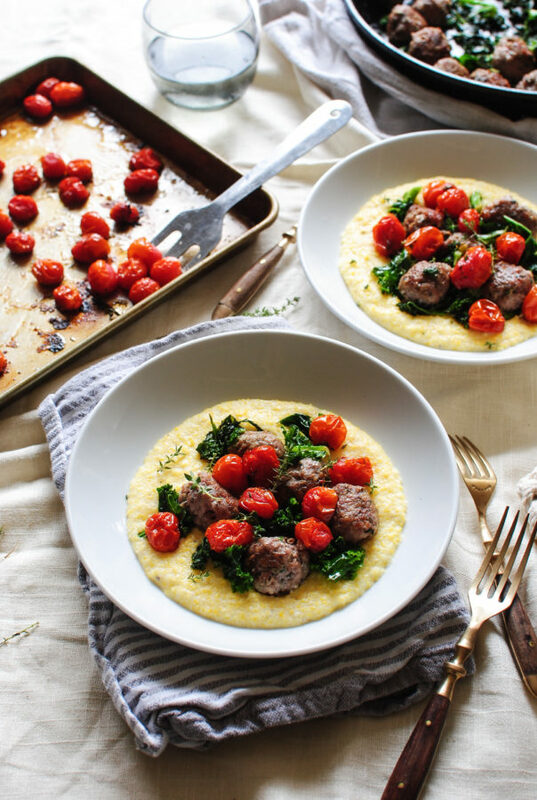 In a large skillet, brown the meatballs on medium, until you get good searing all over, and the meatballs are cooked through, about 8 minutes. Remove the meatballs from the pan. In the meantime, add the milk, water and polenta to a medium saucepan. Stir and simmer over medium, until the polenta is no longer dripping off the back of a wooden spoon, about 15 minutes. Off the heat, stir in the butter, parmesan, a good pinch of salt and pepper. Stir to combine. It should be good and creamy by now. Are tears falling? I knew it. 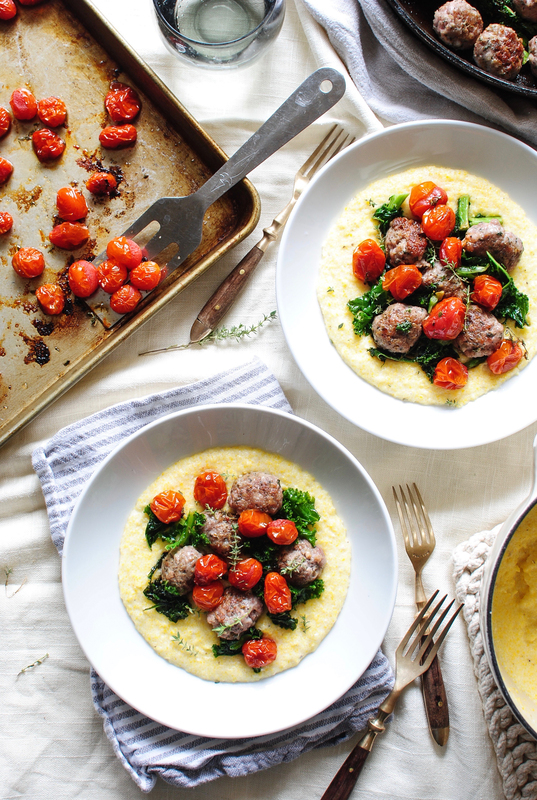 Ladle the polenta into bowls, and top with the sausage meatballs, kale, and a few of the blistered tomatoes. Garnish with more thyme and parmesan if ya want. You should want. Makes about four good dinner servings. Fall eating is so hot right now. >>>>> The soul fairies doing the macarena<<< You just made my day! Also, I'M MAKING THIS ASAP! yuuuummmmm Have fun on your trip, lady! This looks IDEAL for a quick meal...with a toddler at dinner time I can totally appreciate a quick dinner! I made this last night and both my husband and I LOVED it. Simple and delicious. It's going to be a go-to. This is SO GOOD. So good. Seriously, so good... did I mention that? It's always a challenge for me to find the desire to cook after working a full day, but this is incredibly simple and quick. I think I'll make some variation of it every week (and hope we never tire of it). Thank you! This looks so good! I am so hungry right now. Wow this looks really good !! Delicious! I love preparing different dishes.